Chi Kuang Enterprise Co., Ltd.
Chi Kuang was extablished in 1995. The major products are "Multi-function gas pen tools" and "Multi-purpose lighters", and both of them utilizes butane gas as its energy source. 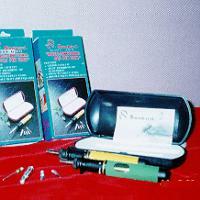 The gas pen tool serves as a soldering iron, torch, hot cutting knife, plastic cutting knife and a hot blower. The lighter equipped with a piezo electronic ignition system, the tool's torch is able to reach temperatures of up to 1300(Celsius). Especially designed for the "DIY" market, this device is multi-functional and easy to use. Future plans to open offices abroad are being examined as the young company seeks to expand its export markets. The company's research department is examining other butane-powered tool ideas for future production as well.